NASA-NOAA’s Suomi NPP satellite passed over the Southern Indian Ocean and captured a visible image of what appeared to be a more organized Tropical Cyclone Wallace, off the coast of Western Australia. 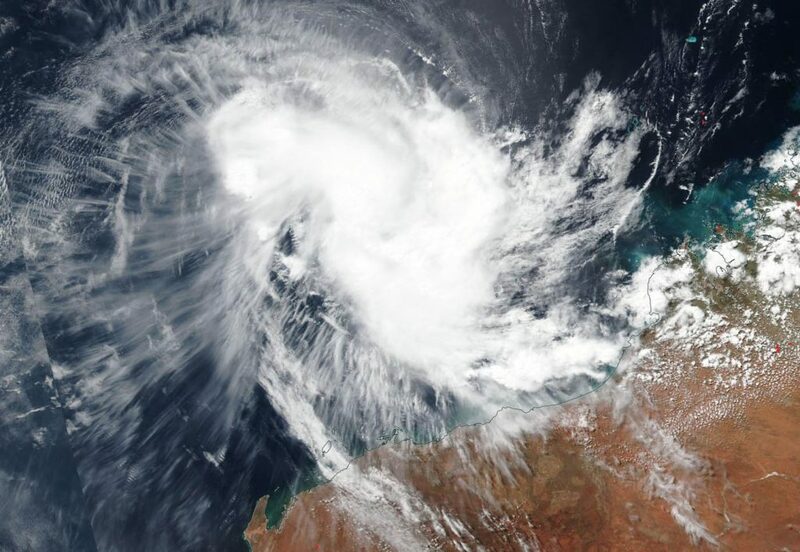 NASA-NOAA’s Suomi NPP satellite passed over the Southern Indian Ocean and captured a visible image of Tropical Cyclone Wallace, on April 8, as it continued to move away from the coast of Western Australia. Credit: NASA Worldview, Earth Observing System Data and Information System (EOSDIS). The Australian Bureau of Meteorology or ABM noted that only a High Seas Warning was in effect off the coast of Western Australia, as Wallace continues to track away from the coast. NASA-NOAA’s Suomi NPP satellite passed over Wallace on April 8 and the Visible Infrared Imaging Radiometer Suite (VIIRS) instrument provided a visible image of the storm. The VIIRS image showed bands of thunderstorms from the western to the southern quadrants. ABM noted on April 8 “An eye is starting to emerge on the most recent imagery with the system adopting a more circular appearance.” At 5:43 a.m. EDT (0943 UTC) satellite imagery showed strong convection (rising air that forms thunderstorms that make up a tropical cyclone) partially wrapping around the center to the west and south of the center. At 8:41 a.m. EDT (8:41 pm WST local time, Western Australia) on April 8, Tropical Cyclone Wallace near 15.8 degrees south latitude and 115.8 east longitude. That’s about 560 km (348 miles) north northwest of Karratha. Wallace was moving southwest at 17 kilometers (10.5 miles) per hour. Maximum sustained winds were near 60 knots (69 mph/110 kph). ABM stated that Wallace is forecast to strengthen over the next day or two before weakening below tropical cyclone intensity Wednesday [April 10] afternoon or evening. A strong mid-level elongated area of high pressure or a ridge, located to Wallace’s southeast, will steer the system to the southwest overnight and then a more westerly track during Tuesday and Wednesday. Wallace is expected to remain well offshore from the Western Australian coastline and is not expected to affect the coast of Western Australia.